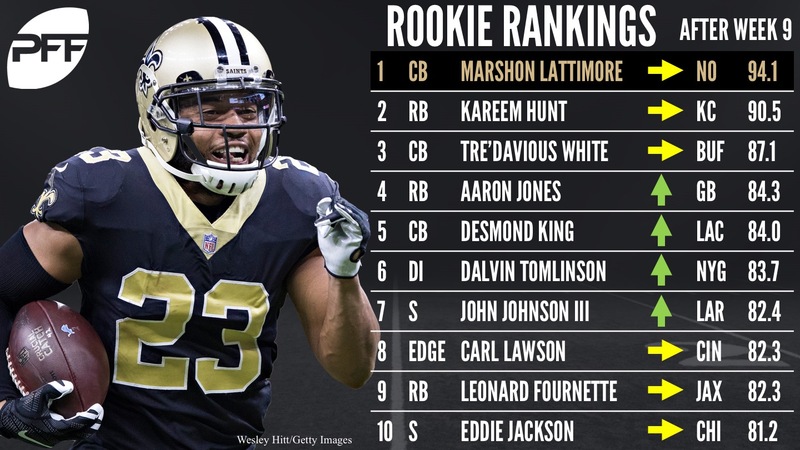 All season long, PFF will be ranking the best performing NFL rookies as they race for Rookie of the Year. See where all of our rookies racing to finish with the highest grade find themselves on our mid-season All-Rookie Team. Below is our weekly rookie rankings after the Week 9 games. Elite Stat: Lattimore has surrendered just 0.61 yards per every snap he’s spent in coverage this season, the fourth-lowest rate among 114 qualified cornerbacks. Unreal, what an unbelievable start to a career. Never would I have ever guessed that as we enter Week 10 of the season a rookie would be our third-highest graded player, regardless of position – up to this point only Bobby Wagner and Aaron Donald have earned a higher overall grade. Opposing quarterbacks have targeted Lattimore in coverage 33 times so far, they’ve earned a 37.4 passer rating on those throws… they literally would have been better off just throwing the ball into the ground (39.6 is a quarterback’s passer rating if they just throw an incompletion on every pass). Lattimore has quickly shown us that he’s one of the best in the business when it comes to making plays on the ball as his 21.2 playmaker index (pass breakups combined with interceptions all divided by the number of targets into a players coverage) ranks sixth out of 102 corners who’ve been targeted at least 20 times. The phenom out of Ohio State is yet to surrender more than 38 passing yards in a game and he hasn’t graded lower than 80.0 in a single game after Week 1. Enjoy the greatness people, as of right now we’re all witnesses to what has been a historic rookie year so far. Elite Stat: Hunt’s 96.2 elusive rating ranks second among all running backs. Hunt has slipped a bit in the past few weeks, but his start to the season was so good that it’s going to take more than a few-week slide to knock him out of the top-2 in this season-long race. Hunt continues to be the only running back this year who ranks within the top-5 in both running and receiving grades and the 42 missed tackles he’s forced on carries are 12 more than any other running back. Elite Stat: White has allowed one reception per every 13.5 snaps he’s spent in coverage this season, the second-best rate among rookie corners. White had what was easily his worst game of the season last week against the New York Jets, it was the first time all season he graded below 70.0 in a game. Despite the bad game though, he still sits rather comfortably in third place still with a bit of a gap both ahead of him and behind him. White, like Lattimore, has shown a penchant for getting his hands on the football, his 20.8 playmaker index ranks seventh (one spot behind the Saints rookie) among corners who’ve been targeted at least 20 times. Elite Stat: Jones has picked up a first down or touchdown on 26.9 percent of his carries, the fourth-best rate among RBs. Jones only carried the ball five times on Monday night against the Detroit Lions as the Packers found themselves trying to play catch-up throughout the game. His 84.2 running grade this season though ranks sixth among running backs and when the Packers have been able to feed him the ball this season, he’s rewarded them with steady production. Even when Jones doesn’t pick up a first down or touchdown, he almost always at least gets something: His 13.4 stuff rate (the percentage of a player’s rushing attempts that result in 0 or fewer yards) is the sixth-lowest among running backs through the first nine weeks. Elite Stat: King is 1-of-2 cornerbacks this season to have recorded at least 10 stops (a solo tackle that results in a “win” for the defense, given the situation) in coverage without missing a tackle. King was playing his best football of the season as the Chargers entered there Week 9 bye, earning an elite 90.5 overall grade the week prior in New England. King ranks 16th among cornerbacks in terms of overall grade and his 83.7 coverage grade ranks 15th. Elite Stat: Tomlinson’s 13 run stops are the 20th-most among 115 qualified interior defenders. The Giants season may be one to forget, but one of the bright spots on this years team has assuredly been the play of their second-round draft pick. Tomlinson has quite literally – at least in terms of PFF grade – done nothing but play good football virtually all season. He put up a 42.7 overall grade in Week 3 against the Eagles, outside of that one game though, he has graded between 79.3 and 83.3 in every other game this year (with five of those games being north of 80.0). Tomlinson set a career-high this past week with three pressures (all hurries) against the Rams and five of his seven pressures this season have come in the last two weeks, if he can continue to contribute as a pass-rusher, pair that with his 85.9 run defense grade and the Giants have found themselves a great interior defender opposite Damon Harrison. Elite Stat: Johnson has allowed just 0.26 yards per every snap he’s spent in coverage so far, the fifth-lowest rate among 61 safeties who’ve been the primary coverage defender on at least ten targets. Johnson ranks 20th among safeties in terms of overall grade and his 84.6 coverage grade ranks 15th. Johnson only saw 12 defensive snaps prior to Week 4 but since then, he’s seen consistent playing time and he’s rewarded the Rams for inserting him into the lineup. He’s finished four out of five games this season with an overall grade of at least 73.7, with his best game of the year coming against Seattle in Week 5 when he put up an 88.1. Elite Stat: Lawson ranks third among edge defenders with a 15.1 pass-rush productivity rating. Lawson ranks 25th among edge defenders in terms of overall grade and his 84.8 pass-rushing grade ranks 13th. Except for Joey Bosa – who, if you follow our lead statistician, Nathan Jahnke on Twitter you very well know, has had an absolutely, Lattimore-esque, start to his career – no rookie edge defender last season finished with a pass-rushing grade higher than 70.1 (if you don’t follow Nathan on Twitter by the way, you’re really missing out as a football fan, go find him @PFF_NateJahnke). Lawson has pressured the quarterback at least twice every game of his career thus far and last week was the fifth game this season he finished with at least four pressures. Elite Stat: 215 of Fournette’s rushing yards have come on runs that went for at least 15 yards, the third-highest total among running backs. For one reason or another, we haven’t seen Fournette on the field since Week 6. Despite the three-week absence though he still maintains his spot in the top-10 in our season-long race for rookie of the year as we pass the midway point (even with the missed time he’s still been on the field for 19 more snaps and touched the ball 56 more times than Saints rookie, Alvin Kamara). The fourth overall pick ranks ninth among HBs with an 81.1 rush grade and he’s one of just three running backs – along with Hunt and Melvin Gordon – who rank within the top-10 in run grade while also ranking in the top-20 in receiving grade. Elite Stat: Jackson is one of six safeties this season to have recorded at least 15 tackles in coverage without missing a tackle. Jackson currently ranks 24th among safeties in terms of overall grade, teaming up with Adrian Amos to form one of this year’s top safety tandems. The fourth-round pick is seventh among rookies with 523 snaps through the first nine weeks of the season and in five of Chicago’s last six games he’s finished with an overall grade of at least 73.4.